This exercise brings together a few principles from my previous posts. If you're in the mood to to a little drawing (15mins). 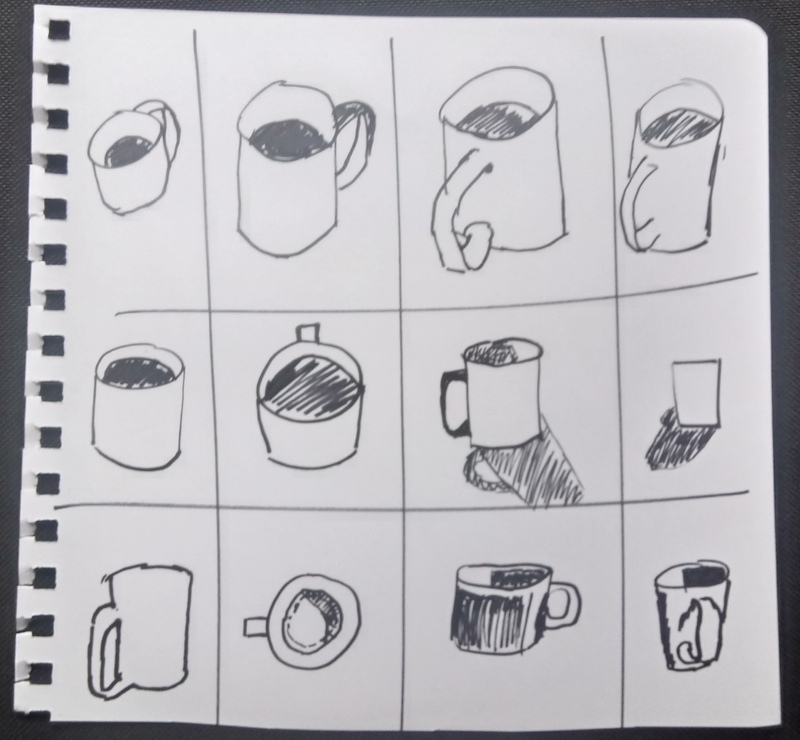 experiment: pick an object (eg a cup) to draw. Divide your page into 20 rectangles. Do a brief sketch in one of the rectangles. For a few moments, thoughtfully and non-judgmentally reflect on it. What interests you, what kind of shapes are there? Draw another cup variant, noticing as you go. This exercise is taken from the youtube video: Iterative Drawing, the fastest way to improve. 40min video. The tl;dr is the exercise above. You do a tiny drawing experiment, and non-judgementally pay attention to what happened. You are generating a lot of interesting data. And you’ve paying attention to it. Quality and quantity. Anything you notice can then feedback into the generation process. The changes are cumulative. The results of each experiment inform the next batch of theories. Maybe the handles too large, perhaps a different angle. You’re also focusing on the fundamentals, shape and proportion. Not focusing on the details. I'm reminded of that anecdote about grading pottery students by quantity. You will be marked by sheer number of pots produced. This strange metric let to much better pottery. story and discussion here. More Brienne: an "original seeing"-esq post.